In the face of growing antibiotic resistance and few antibiotics in the development pipeline, phages are drawing renewed research interest as a potential silver bullet. What happened next is the ultimate infectious disease feel good story: Strathdee, part of an All-Star team of infectious disease experts and epidemiologists, concocted a cocktail of viruses that killed the superbug and saved Patterson’s life. Dr. DeBiasi explains that all viruses take over cells and use their machinery for their own purposes. In order to escape, viruses blow up the cell. 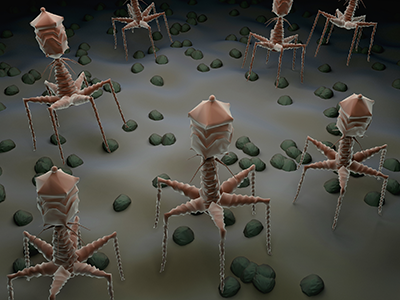 Bacteriophages are viruses that target bacteria, taking over their machinery and ultimately killing the bacterial host. 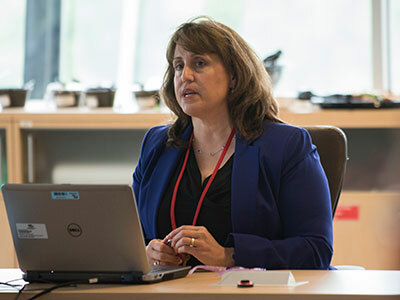 She was so inspired by the team’s ingenuity that DeBiasi, program vice-chair, invited them to recount the story during IDWeek2018, held Oct. 3 to Oct. 7, 2018, in San Francisco. During the closing plenary, Patterson, a professor of psychiatry, and Strathdee, associate dean of Global Health Sciences, will be joined by Robert T. “Chip” Schooley, M.D., (all of University of California, San Diego), to discuss the clinical aspects and efficacy of phage therapy. About 50 years ago, the U.S. military had investigated leveraging phages but ultimately placed that research portfolio on the back burner. Now, in the face of growing antibiotic resistance and few experimental antibiotics in the development pipeline, phages are drawing renewed research interest as a potential silver bullet. “The technology has been around for 50 years. We’re going back to old things because we’re so desperate,” Dr. DeBiasi adds. The tricky thing with phages is that each bacterium needs its own tailored phage therapy. 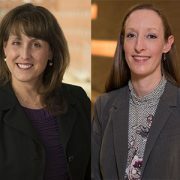 Children’s National is working with Adaptive Phage Therapeutics, a company based in Gaithersburg, Maryland, that developed the phage used to save Patterson, in order to help build out that library of phages, each ready to be directed to do battle against a specific pathogen. 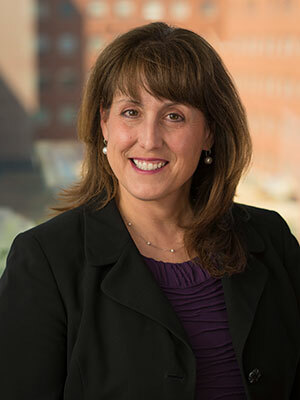 “We have been consultants to them to think about what would be a good clinical trial, particularly in a pediatric population,” Dr. DeBiasi says. 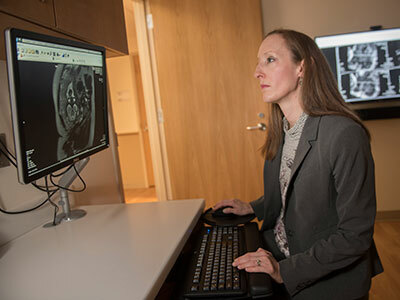 Children’s National has been collecting and sending isolates from patients with neurogenic bladder who experience urinary tract infections to shore up the phage library in anticipation of a clinical trial. 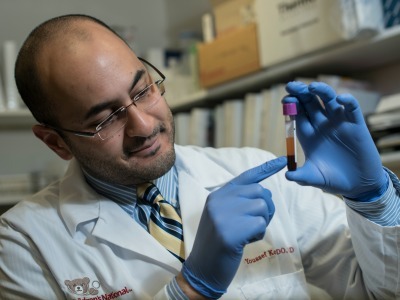 The work builds on Children’s experience as the first center to use phage therapy in a pediatric patient, a 2-year-old who had multidrug-resistant Pseudomonas aeruginosa infection complicated by bacteremia/sepsis. 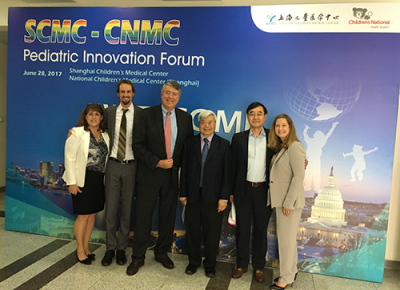 Physicians from the Children’s National delegation attended the Shanghai Pediatric Innovation Forum in June 2017. 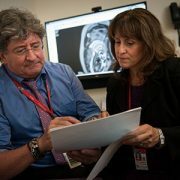 Pictured (left to right): Roberta DeBiasi, M.D., Michael Mintz, M.D., Robert Keating, M.D., Lawrence Jung, M.D., Peter Kim, M.D., and Sarah Birch, D.N.P., A.P.R.N. The group, led by Drs. 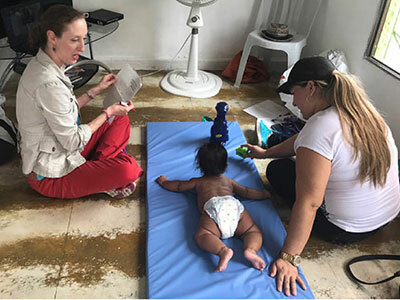 Keating and Gaillard, traveled to China with Children’s Outreach Coordinator John Walsh, whose longtime connections and close familiarity with the pediatric medical community in Hangzhou and Shanghai made the collaboration possible. The team toured several of the largest children’s hospitals in country, including The Children’s Hospital of Zhejiang University School of Medicine in Hangzhou and Shanghai Children’s Medical Center, connecting with pediatric specialists there. 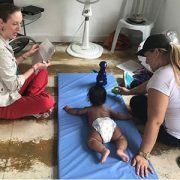 “Some of the most important parts of this trip were the opportunities to exchange ideas and solidify long term relationships that will allow us to work closely with our peers in China as they develop their pediatric programs. 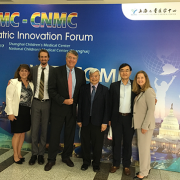 The potential is tremendous for unique collaborations between our teams and theirs for research and the development of clinical care improvements for children,” said Roger Packer, M.D., senior vice president of the Center for Neuroscience and Behavioral Health, who joined the delegation in Beijing. The delegation also was honored with an invitation to participate in the 3rd China International Forum on Pediatric Development. The forum is one of the largest pediatric focused meetings in the country and is led by all the major children’s hospitals in China, including those in Beijing and Shanghai. 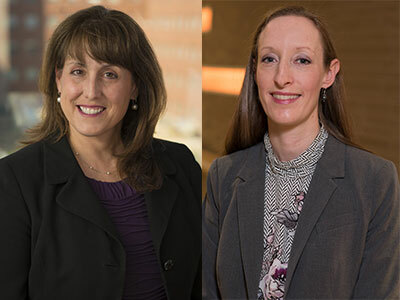 Close to 4,000 pediatricians attended the meeting, and presenters included esteemed international leaders in pediatric medicine from around the world. Dr. Packer delivered one of the opening keynote lectures, entitled, “Translation of molecular advances into care: the challenge ahead for children’s hospitals.” His talk focused on the tremendous promise and significant challenges posed by the latest scientific advances, through the lens of a neurologist. “There’s palpable excitement that these new developments will give us potential therapies we never dreamed about before, ways to reverse what we initially thought was irreversible brain damage, ways to prevent severe illnesses including brain tumors, but the issue is how to turn this promise into reality. That’s a worldwide issue, not simply a single country’s issue,” he continued. He also flagged mental health and behavioral health as a crucial, universal challenge in need of addressing on both sides of the Pacific. The Children’s National delegation, including Drs. 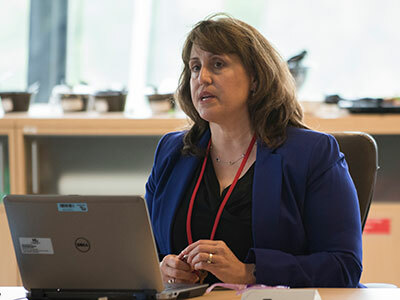 DeBiasi, Song, Keating, Gaillard and Packer were also honored to share their insight in a series of specialty-specific breakout sessions at the Forum. Overall, the long journey opened a dialogue between Children’s National and pediatric care providers in China, paving the way for future discussion about how to learn from each other and collaborate to enhance all institutions involved. Treating Lyme disease: When do symptoms resolve in children? Some experts are predicting a rise in the number of ticks this year. That potential boom could lead to another boom – in Lyme disease, a bacterial illness transmitted specifically by deer ticks. For many Americans, the warmer weather of summer means more time spent outside: More gardening and yard work, more hikes in the woods, more backyard barbecues. But for this year in particular, some experts predict warmer weather will lead to more ticks. That potential boom in ticks could lead to another boom – in Lyme disease, a bacterial illness transmitted specifically by deer ticks. 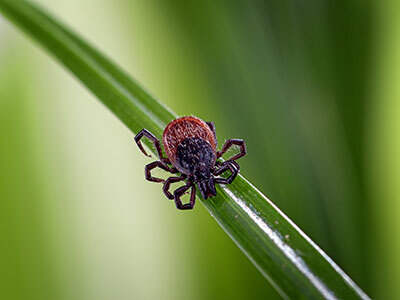 When ticks attach for at least 36 hours – what studies have shown is typically the lower bound needed to transmit Lyme-causing bacteria—many patients develop a bullseye-like rash at the site of the bite within seven to 10 days. If they’re not treated quickly, within weeks patients can develop symptoms such as headaches, heart arrhythmias, rashes and facial paralysis. Within months, Lyme can lead to arthritis, most commonly of the knee. 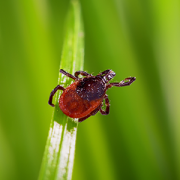 The standard treatment for Lyme disease is a course of antibiotics, such as oral doxycycline if the patient is older than 8 years old or amoxicillin if the child is younger than 8 – typically two weeks for early symptoms and longer for late symptoms. 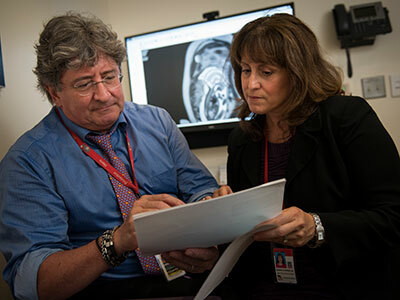 While the data showing when symptoms clear has been well established for adults, says Mattia Chason, M.D., a third-year resident at Children’s National Health System, little was known about how quickly symptoms typically resolve in children. 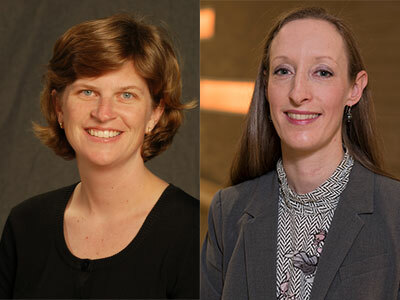 That paucity of data can leave physicians and their families unsure about whether a child might need a repeat dose of antibiotics – or a different kind—or whether lingering symptoms might have a different cause. 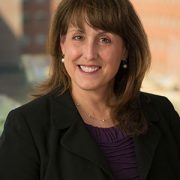 To answer this question, he and colleagues – including Dr. Chason’s mentor, Roberta L. DeBiasi, M.D., M.S., chief of Children’s Division of Pediatric Infectious Diseases – looked at data in the electronic medical records of 79 children who were admitted to Children’s main hospital with a laboratory-confirmed diagnosis of Lyme disease from June 2008 to May 2015. The research team was particularly interested in children who had a headache – a strong marker of the early disseminated form of the disease – or pain and swelling of the knee, a strong marker of the late form of the disease. 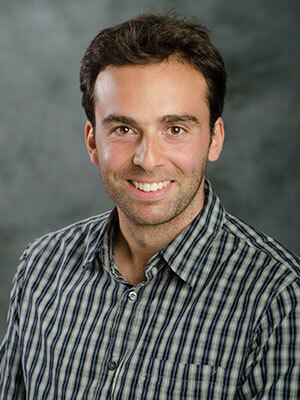 Mattia Chason, M.D., and colleagues in infectious disease examined how quickly Lyme disease symptoms typically resolve in children, a research question that has received little prior study. 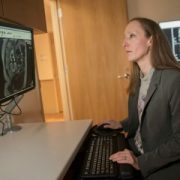 They found that after children with the early form of Lyme disease started treatment, their Lyme-associated headaches resolved rapidly – most within one to three days­ – no matter how long headaches were present before they came to the hospital for treatment. However, for those with knee pain and swelling, the majority took between two to four weeks to resolve. The longer symptoms had been in place before treatment started, Dr. Chason says, the longer they tended to take to disappear. The team also looked at a phenomenon called post-treatment Lyme disease syndrome, characterized by a constellation of symptoms, such as fatigue, generalized musculoskeletal pain and cognitive slowing, that can occur six months after an initial diagnosis of Lyme. 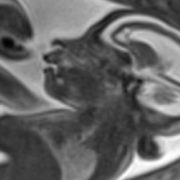 Only two children out of the 79 met the criteria for this diagnosis, suggesting that it’s exceedingly rare in the pediatric population. 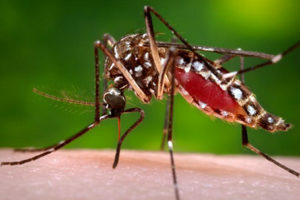 Help kids avoid exposure by either wearing long sleeves and pants – a tough sell in warm weather – or using repellents with 20 percent to 30 percent DEET. 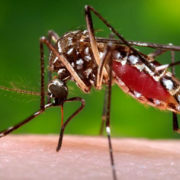 These repellents can be used on babies as young as 2 months old, Dr. Chason says, and are safe for most individuals. Check for ticks anytime a child has spent time outside. 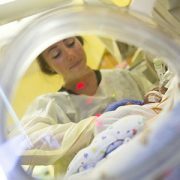 The best way to perform them, Dr. Chason says, is to check the child each night. Before bath or bedtime, remove the child’s clothes and check every part of his or her body, including their hair, armpits, buttock region and the creases of the knee. Remove ticks gently with tweezers to try to get as much of the arachnid out as possible. Know what deer ticks look like. 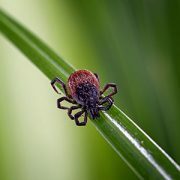 If you are unsure how to identify this species, save the tick or take a photo for your pediatrician to view. 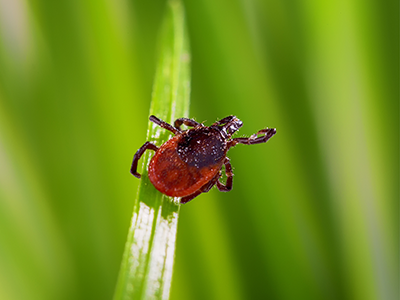 If a tick has been attached for at least 36 hours, consult your child’s pediatrician for advice on whether the child will need prophylactic antibiotics. 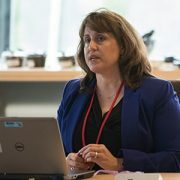 https://innovationdistrict.childrensnational.org/wp-content/uploads/2017/06/Deer-Tick.jpg 300 400 Innovation District https://innovationdistrict.childrensnational.org/wp-content/uploads/2018/11/idlogo1-tagline-Advances-in-Medicine.gif Innovation District2017-06-23 13:44:052018-02-05 11:11:34Treating Lyme disease: When do symptoms resolve in children?